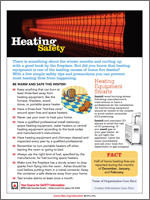 Heating equipment is one of the leading causes of home fires during the winter months. Our greatest defense against these fires is education. That’s why NFPA has developed this "Keeping Your Community Safe and Warm" toolkit that you can use to conduct a heating safety awareness campaign in your community. Whether you're talking to the media or your neighbors, here are some talking points to help you stay on point. Your neighbors are your best resource to help spread heating safety messages. Download this free tip sheet, because with a few simple safety tips and precautions you can prevent most heating fires from happening. Heating equipment is a leading cause of fires in U.S. homes. Get the latest statistics in this free NFPA report. Customize these resources and work with local media to help spread the word about electrical safety. 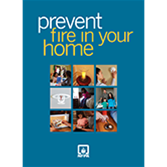 The NFPA photo-filled Prevent Fire In Your Home Booklet gives families the big picture on saving lives from fire! 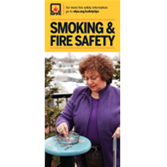 Teach adults how to safeguard lives and property with the brand new Smoke & Fire Safety Brochures!